½ – ¾ C milk, depending on how thick you like your pancakes. The night before you want to make pancakes, combine the starter, flour and milk in a bowl. Cover and let it soak at room temperature for at least seven hours. In the morning, preheat your griddle. Then stir the flour/starter/milk mixture. Beat two eggs in a separate bowl then add them to the batter. Then add the salt, baking powder and optional vanilla and/or spices. Gently mix in the melted butter and let the batter rest for five minutes. Grease your griddle with coconut oil or butter. 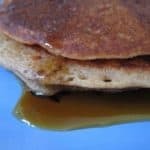 Scoop pancake batter onto preheated griddle and allow the first side to cook until you see bubbles forming and the edges getting dry or until the first side is golden brown. Flip pancakes and cook until the second side is golden brown. Katie’s note: because sourdough pancake batter is always a bit bubbly, watch for the dry edges over the bubbles on top.